Romanian Meatball Soup, truly a classic and most certainly a much loved soup. Hearty, and comforting, but low calorie, high protein and gluten free, our “ciorba de perisoare” has been a favourite for years, and is regarded as one of our traditional dishes. 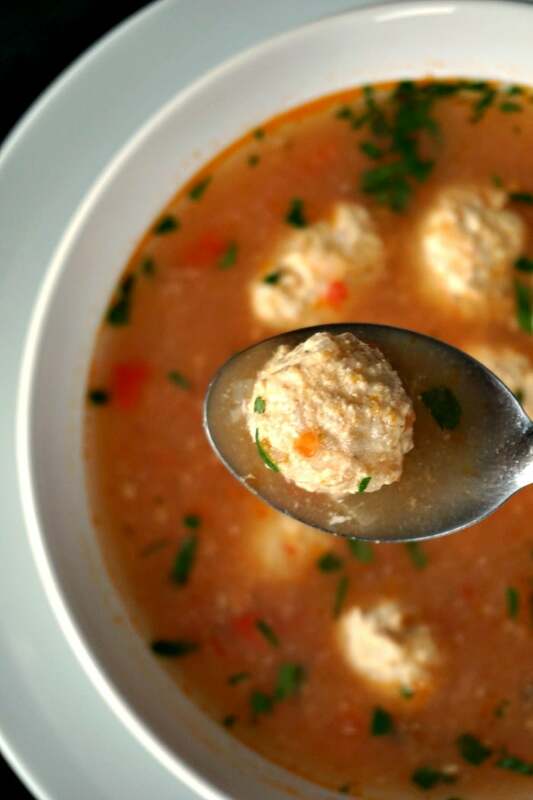 We are a nation of soup lovers; we have soups as a starter with every single lunch or dinner meal. Whether vegan, vegetarian or meat based, soups are ever so popular. We usually make the distinction between “ciorba”, which usually has diced vegetables and meat in it. And “supa”, where the vegetables and meat have been removed after cooking and either noodles or semolina dumplings are added to it, making the soup a much lighter and less heavy option. Either way, our soups are fantastic and we can’t have enough of them. 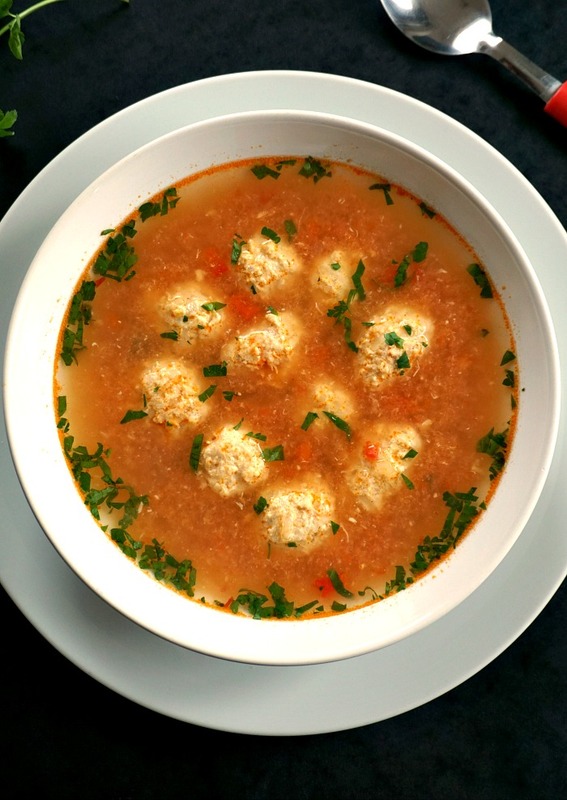 My Romanian meatball soup is made of minced turkey, (although pork, beef or chicken are also popular choices, or even a combination of any of these) and rice, plus you can add any vegetables you like to make them healthier. In winter time, pork is the favourite meat, and most of our meat dishes will be prepared using pork. In summer time tough, as temperatures often reach +35 degrees C, we stick to chicken or turkey. 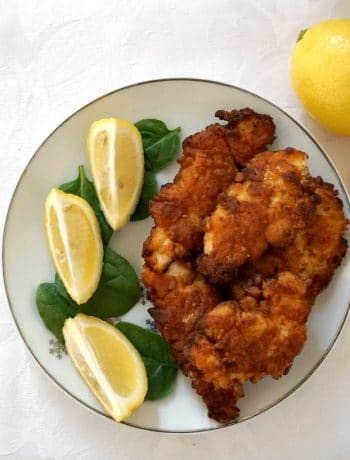 But, of course, it comes down to personal choice as well, and l seem to be cooking a lot more often with chicken and turkey lately, no matter the season. A good Romanian meatball soup has a vide range of vegetables added, the most popular being onion (either red or yellow), carrots, peppers of any colour, and any other preferred veggies. I usually stick to these ones. If you usually fry the meatballs in order to seal them before adding them to your dish, with the Romanian meatball soup you don’t have to. 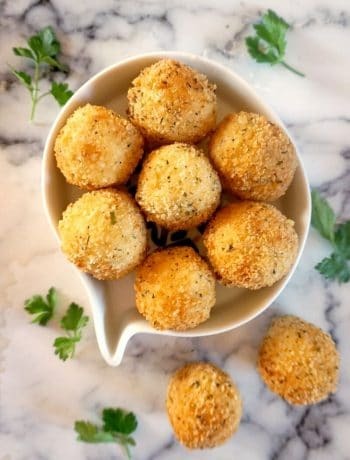 The consistency of the meat mixture is a lot thinner due to the eggs used, so no panic if you find that shaping the meatballs is not as easy as the ones you make for spaghetti and meatballs for example. 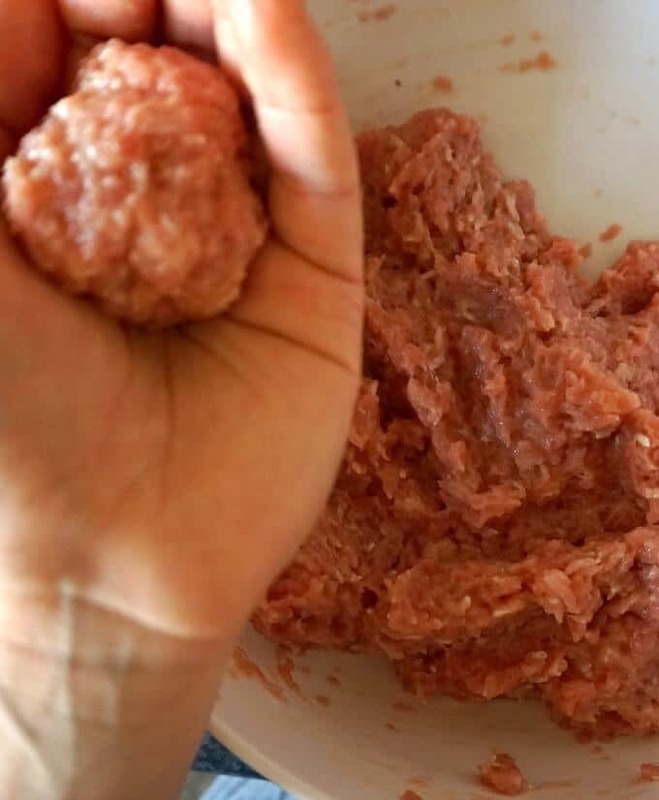 Just wet your hand, shaping a meatball and carefully drop it into the boiling soup. It will defintiely not fall apart. The little bits you see forming in the soup are from the egg used, so totally normal. The soup is absolutey delicious, trust me. I like adding a bit of rice in the meat mixture, just a small amount, but it’s totally optional, just meat and eggs would do. You can also season the meatballs with salt and pepper if you wish. I must say that, ever since l moved to the UK some 8 years ago, l stopped having soups so often, which is quite a shame really. But maybe that’s what makes them taste even better whenever l visit my family, both my mum and grandmother make amazing soups. I miss them dearly! 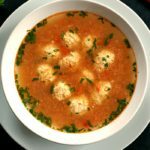 So, if you want to have a try, this soup is super easy to make and is definitely one of the most delicious soups out there. I can’t get my older daughter to eat any soups, but then she’s so picky, I consider myself lucky if she eats any proper food anyway. I still hope it’s just the terrible time of toddlerhood, and once she grows out of this fussiness nonsense, she will get better with food. But let’s live and see. If you’ve tried this HEALTHY ROMANIAN MEATBALL SOUP WITH RICE or any other recipe on the blog then don’t forget to rate the recipe and let me know how you got on in the comments below, I love hearing from you! You can also FOLLOW ME on FACEBOOK, and PINTEREST to see more delicious food and what I’m getting up to. Healthy Romanian Meatball Soup with Rice, truly a classic and definitely one of the most loved soups. 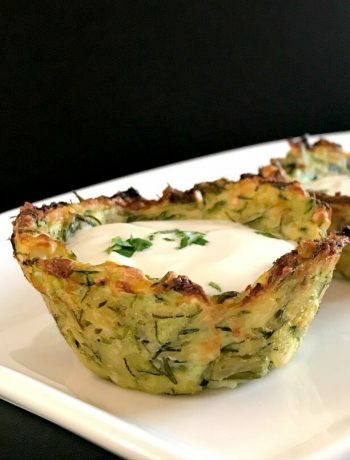 Super easy to make and so tasty, you will want to make it again and again. Bring the stock/water to the boil. Feel free to use more or less amount, as it entirely depends on how thick you like the soup. 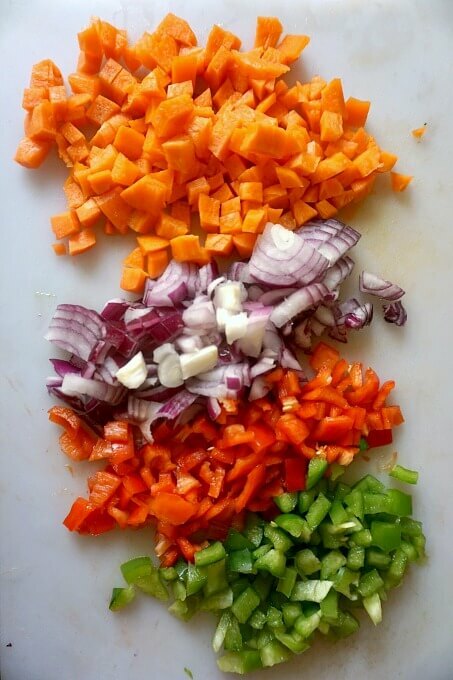 Chop the onion and peppers and add them to the pan. Boil for about 10-15 minutes or until they start to soften. In a bowl, mix the turkey mince with rice, oil, egg and season well with salt and pepper. Use your hands to shape balls. 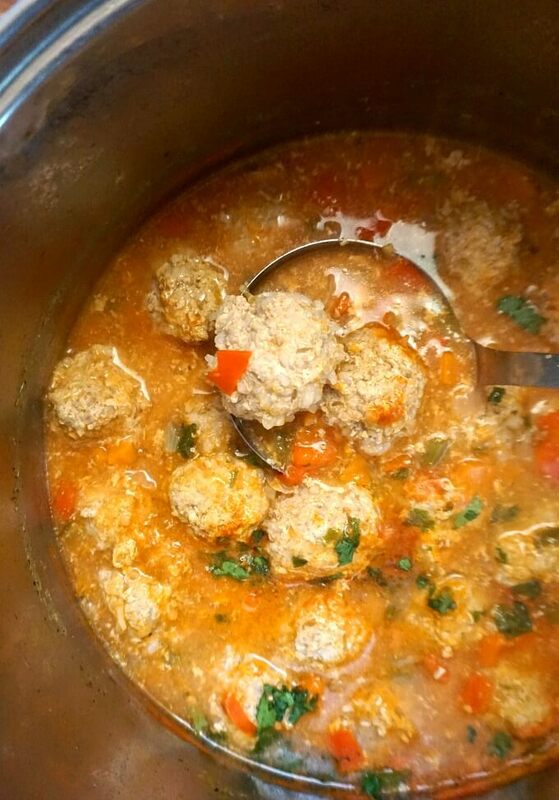 Add the meatballs to the soup one by one, and leave them to cook through. You can now add some noddles or rice to the soup as well, if you want a thicker soup, but this is entirely optional. Once the meatballs are cooked, (approximately 15-20 minutes) add the tomato paste, lemon juice, season well with salt and pepper and remove from the heat. Add the chopped parsley and allow the soup to rest for 5 minutes before serving.